Is there anything better than traveling with your pet? Everyone who has a dog knows the importance of spending time with him and we plan our vacations and trips always keeping in mind, since they are part of our family and we do not want to be separated from them. When it comes to scheduling a trip we almost always look for natural or open-air destinations in which our dog can run freely without having to be tied, always looking for the enjoyment of both and do not worry as much as possible. 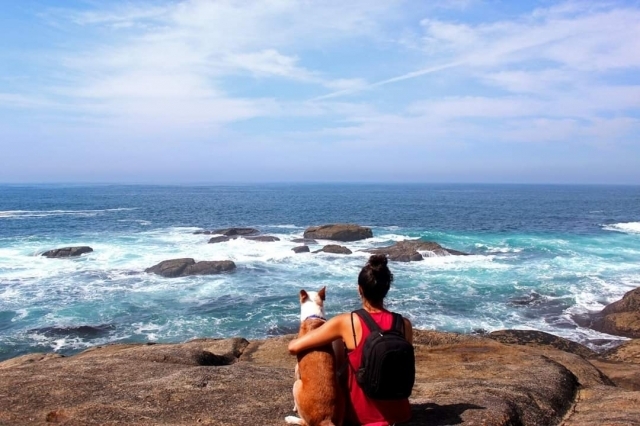 The Camino de Santiago is a good option if you want to enjoy an unforgettable vacation, walking through the beautiful surroundings of the Galician countryside, discovering its fairytale landscapes, tasting the typical dishes of its gastronomy and the best, doing it accompanied by your hairy friend. But doing the Camino de Santiago with your pet can become a real headache, the shortage of accommodation that admit dogs and transportation restrictions when traveling makes many people choose to leave it at home in the care of their parents, neighbors or friends. The task of organizing the trip can be even more difficult if we take into account that certain accommodations, in spite of admitting pets, have certain admission policies regarding the size and weight of dogs, breeds or limitations to one animal per room, in addition to charging an extra supplement. But more and more agencies and platforms offer packages to travel with your pet at affordable prices. We were able to contact one of the best rated agencies in the Camino de Santiago with dog, the agency viajecaminodesantiago.com. Hiring an agency to make the trip organized with your pet can be an ideal option if you want to be carefree of the planning of the trip and want to enjoy the experience with a quality service and the security offered by a travel agency. 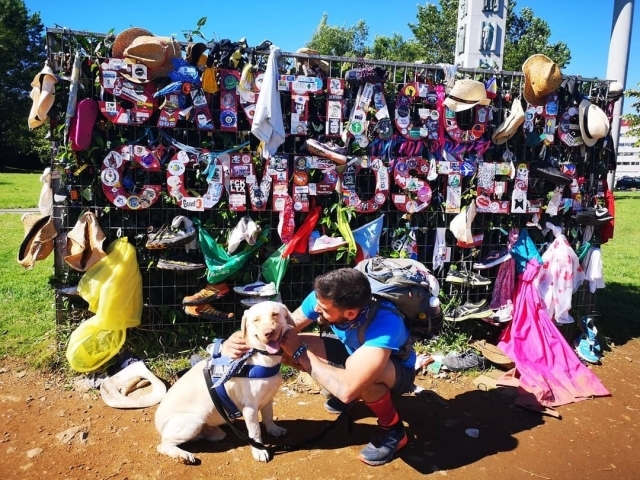 Below we will review the preparations and recommendations before and after that you must take into account to make the Camino de Santiago with your pet and make it a perfect experience for both. Preparations to do the Camino de Santiago with a dogKeep in mind that your pet must have a microchip and be vaccinated, it is important that you carry with you the health certificate and the document accrediting the rabies vaccination. If you have any doubts, ask your veterinarian for advice on this topic. Do not forget to take the APACA association's credential, the Pilgrimage, which can be provided on trips to Santiago. Know your dog, not all dogs have the same characteristics so possibly many tips are not appropriate for him. Observe their behavior in different situations and above all, apply logic and love towards him. Prepare it physically. You must assess the physical condition of your dog before the trip and its daily activity level. It does not work with walks of 10 minutes a day, if you are not used to great walks, we recommend that you make daily departures of several kilometers to see how it responds. As a general rule, although there are exceptions, the pilgrimage with puppies of less than 10 months is discouraged. If you have a very small dog, you will need to carry it in your arms or similar at times. You must value all these aspects and not put your wishes before your welfare. When preparing the backpack for you and your pet, keep in mind that you will have backpacking service during the stages, so you will not have to carry your luggage, with a small backpack for the walk will be enough. Although on the way you will find pharmacies and veterinary clinics, it is important that you are provided with a good kit with disinfectant, petroleum jelly for pads and mosquito repellent. Hydration, rest and good nutrition is essential in this trip. We recommend you take a drinker and portable feeder with you to offer water when you need it. Along the way you will find numerous fountains and springs, what an eye! They are not always drinkable. The best option is to take a bottle of water with you, following the norm, "a liter for me, a liter for you". The little bed, the blanket if it is cold, its toys .. nobody better than you knows how is the rest of your pet. It is not necessary to take food for a week: on the Camino you will find numerous supermarkets and / or pet shops where you can buy feed for your pet. In this way you have enough for the trip and the first two days you will have enough. And finally, do not forget your leash! For a trip of this type, in which your dog will walk many kilometers a day, we recommend the use of a harness that is comfortable, totally discarding the use of collars. 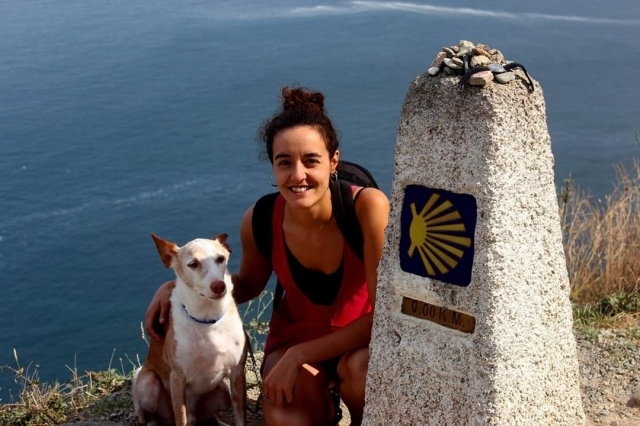 The displacement with your dogThe best option to move to the starting point of your Camino de Santiago accompanied by your dog, is always in your own vehicle; You will gain in comfort and the trip will be much more relaxed for both, since you can make as many stops as necessary. Once you reach the starting point of your Camino, you will have no problem leaving your car parked in the village and pick it up at the end of the trip; or if you prefer, choose to leave it in some private parking. If you do not have the possibility to make the trip in your own car, you can use public transport, which also allows pets, although their policies are quite restrictive and may apply supplement. By busWith the exception of guide dogs, the law establishes that dogs will have to travel in the bus's warehouse, inside their respective carrier. By trainYou can only travel on a non-commuter train if your dog weighs less than 10 kg and travels inside a carrier whose dimensions do not exceed 60x35x35. By planeIn low cost companies, traveling with a dog is usually prohibited in any of the ways. In the other companies, small dogs up to 8 kg can travel with you in the cabin inside your carrier, while the larger ones can travel in the hold. It is usual to charge a supplement on the ticket. Dog friendly accommodation for dogsWhen traveling with a pet, accommodation is one of the main obstacles to face. Surely many times you have felt discriminated in some establishment by the fact of having a pet or you have not been able to access certain places accompanied by your dog. In spite of the many advances of the society in the last years, in this subject a pending subject exists. With viajecaminodesantiago.com you will have the guarantee that the hired accommodations are respectful and friendly with the pilgrims and their pets, providing hospitality and closeness; They will stay in private rooms of hostels and hotels, guaranteeing rest for both after a hard day of walking. You will also benefit from a dossier with the best recommendations, information on the layout of the stages, places of interest and bars and restaurants where you can enjoy the exquisite Galician cuisine with your four-legged friend. Keep in mind that many establishments that claim to admit pets, in reality the reality is very different. An establishment that asks you to tie your dog to a fence is not dog friendly, nor is it the one that allows you to lock your partner in a canine, alpendre or similar while you sleep in the room. During the stages, what should you keep in mind?Organize your dog's food before the stages. Your dog will do a lot of exercise and will be exposed to cold, rain, heat or stress, so feeding is the most important factor. Make sure that the food is varied and rich in protein and energy. You should also provide fresh water whenever you need it. If you decide to make your Camino de Santiago in the summer months, it is important to protect it from the heat, the sun and the scorching asphalt. Try to go for a walk in the early hours of the morning, avoiding the hottest hours. Some types of dogs, such as boxers, suffer a lot because of their difficulties in breathing because they are very close to the asphalt, keep this in mind if it is your case. If it rains a lot, take care to dry it well at least at night, the cold and constant rain can also affect you depending on the type of dog and its habits. Do not forget your pads! The routes are sometimes too long and the asphalt can make a dent in the legs of your dog. Wash your legs well at the end of each stage and hydrate the pads using Vaseline or specific products. Your health is the most important. Observe their behavior as the days progress, their mood, if they show signs of weakness or have any discomfort. If you suspect that you may be sick, you should take it to a veterinarian as soon as possible for a checkup and assess your physical condition. In the main towns of the Camino de Santiago, you will find veterinary clinics that will take care of you without any problem. In case you can not continue, the best option is to take a taxi to get to the accommodation, rest and see how it evolves to continue the next day. If you decide to contract the trip with the Viajes Camino de Santiago agency, you will also have a 24-hour emergency telephone number, where they will provide you with support and help in the event of any unforeseen event or problem. Observe your dog and provide him with the rest he needs at each moment. Do not set goals that your faithful friend can not stand. So you will both enjoy the trip more. One of the big doubts that arise when it comes to making the Camino de Santiago with a dog, is when to take it tied and when not. Our recommendation is to always have it tied to roads and urban areas, but for rural roads, fields, forests and rivers the best option is to let it enjoy, always keeping in mind your level of obedience to your calls to avoid scares. In Galicia it is allowed by law that dogs go loose on rural roads, so you will always see loose dogs in the villages. Tie your dog when you pass through any of these population centers to avoid incidents that may harm both animals. Arrival in Santiago: Pick up your Compostela! Upon your arrival in Santiago de Compostela, you can not forget to collect your well-deserved Compostela, the document that certifies the completion of the Camino de Santiago. To obtain it, you will only need the credentials that you have been stamping during the stages. This is where the Protective Association of Animals of the Road (APACA) comes into play, a non-profit association in which their volunteers, among the many activities they perform, focus on the help and collection of abandoned dogs and dogs. or lost along the Jacobean route, carrying out campaigns of prevention, sensitization and protection of animals. The Compostela Pilgrimage of your pet, you can pick it up at the office of the APACA association, located at Fontiñas Street number 27 and its opening hours are from 08:30 to 14:30. In case you arrive after hours, do not worry, you can contact the protector by phone at 604028306 and they will attend you without any problem. Once there, the volunteers of the protector will assess the status of your pet and will be interested to know how it has been the experience of making the Camino de Santiago with your dog. Camino completed. Once you have enjoyed your last day of pilgrims and peRRegrinos it is time to pack your bags, return home and take stock of the trip. A path that has made you see things in a different way, from which you will take your backpack loaded with new friendships and wonderful and unforgettable moments with your dog, creating an unbreakable bond with him. We are sure that your travel partner is also happy to have shared this trip with you. And he is already waiting for the next destination!